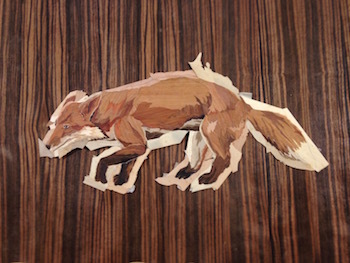 The whole fox has been put together and is ready to be cut into a Macassar ebony background. A hole will be drilled on the perimeter and the entire animal will be circumnavigated. So the hole in the ebony is produced by the cutting of the fox. Note that the fox is facing left here while the original drawing was facing right. This is because we are looking at the glue side of the veneer. When the panel is glued up it will have the image facing right.